I stamped six bottles on Neenah solar white cardstock and did some simple coloring with copics. I then cut them out and arranged them around my sentiment on the card base, the tops of the bottles that I trimmed off the sides of the card are what I used to fill in some of the spaces so I used most all my scrap pieces of my bottles. 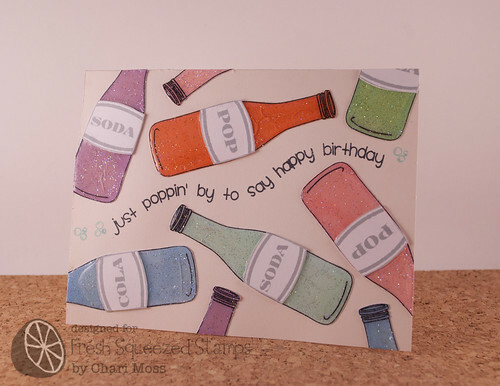 (In hind sight I should have done this next step before I adhered them down to the card but sometimes you don't think of things like this when creating) I added star dust stickles to each bottle by spreading on a layer with my finger. Then I covered each bottle with a layer of glossy accents. I cut out the labels, which I stamped using soft granite shadow ink, then pressed them into the glossy accents. The moisture from the stickles and glossy accents really warped my card. And I managed to flatten it out some by ironing it once everything was dry. I let it dry overnight before attempting this. If I did it over I would gloss up the bottles and let them dry before placing them on my card. Such a fun card. Love the shine and sparkle!